Join as part of the Pink Turtles team and get $5 off registration. The Pink Turtles will be participating in this years walk to end Alzheimers so we hope you will join us in this great cause. Calling all Caltech Pink Turtles! The Pink Turtles will be attending the 2018 Caltech Benefits Fair to help promote a healthy lifestyle by just getting out there and moving. The 2018 Fountain to the Falls Run/Walk is a 6.38 mile out-and-back race, from the Library Park Fountain to the Canyon Park Waterfall. This eighth annual race will be held on Saturday, May 12, at 7:00 a.m. Medals will be awarded to the best finishing times for male and female participants. The Pink Turtles are working towards this event to celebrate our commitment to women's health. Come out and join Maria on her weekly run/walks at Caltech to get the team in shape for the 5K. Attend 4 walks, and you'll receive a free Pink Turtles shirt to represent the Pink Turtles at this years Alhambra 5K. Intrested in our group run/walks? Help Pink Turtle's Sabrina Bates raise donations for the American Heart Association. This year she is personally walking for her Uncle Tom and her friend Mark and his mother Joan. Join Sabrina as a Pink Turtle and help raise donations for a great cause. My Team, The Pink Turtles & I will be participating in AVON 39 The Walk to End Breast Cancer. It won’t be easy, but that’s why it's worth it. From now until AVON 39 weekend which is September 9th & 10th, I’ll train to strengthen my body to walk over 39 miles in two days. I’ll also be raising funds to crush breast cancer. This is where you come in. Your donations will be managed and disbursed by the Avon Breast Cancer Crusade. The dollars you pledge will put food on the table of a breast cancer patient and her family. They will enable access to mammograms and medicine, fuel research, and save lives. Need any more reason to click that Donate Now button? I’m walking with thousands of other 39ers. We’re banding together in solidarity and have one goal: to take breast cancer down. So many sisters and mothers and friends have been lost. We see a world without breast cancer for our daughters and nieces. AVON 39 is a force of change that can’t be stopped. By supporting me with a donation, you’re part of it. With the Santa Ynez Mountains as a dramatic backdrop, Santa Barbara 39ers will experience this quintessential coastal California city from the calming coast to the dynamic downtown. From the Mediterranean style buildings to the red-tile roofs, this beautiful city shows off its proud Spanish colonial heritage and its amazing support of AVON 39. Join us Sunday August 20th at 8am for an incredible workout hosted by Coach Joseph Hawthorne at Copper Moose Fitness. Help us raise money for the Avon39 Walk to End Breast Cancer. Coppor Moose Fintess will be hosting a 1 hour session to help raise funds. Only $10 at the door and 100% of procedes goes directly to the goal of ending breast cancer with Avon39. Get your sweat on, have a great time, and benefit a great organization. Maria will be with other Pink Turtles at this coming Spartan Sprint - join our weekly training to work towards your own Spartan Race. The Mustache Dache is a timed 5K and 10K run where all participants are encouraged to come wearing their best mustache, if you can’t grow a mustache draw on a fake one, all mustaches are welcome (men, women and children). After runners cross the finish line and collect their Mustache Dache medal, they enter the Mustache Bache with an awards ceremony, music, costume contests, dance offs, and Mustache Dache photo ops all around. It’s 5K of mustache revelry benefitting men's health. On Sunday October 2nd, 9am the Pasadena Fire Department is having their annual walk around the Rose Bowl to kick off Pasadena Goes Pink Month. This year they will have a wellness fair in Brookside Park after the walk. The Pink Turtles will be joined by Nike, Run With Us, Corepower Yoga, Pure Barre, BaseCamp Gym, Nutrishop, Thrive, Rodan + Fields, & Cornerstone Chiropractic. In addition California Pizza Kitchen will be on hand with samples as will a few other local restaurants. Bring the kids as a bounce house for the kiddos will be open. The Reebok Spartan Sprint is perfect for athletes of all levels; from Spartan first timers to seasoned racers. The 3+ Mile Sprint may be our shortest distance but it packs more than 20 Signature Spartan Obstacles including mud, fire, walls and barbed wire. If you think you can’t do it, you’re wrong. Get to the starting line and show yourself what you are capable of. 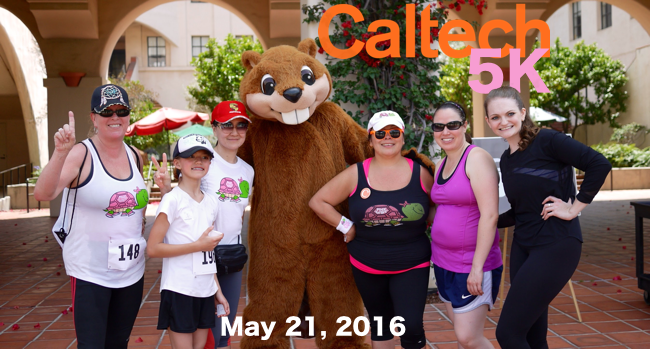 Join us for a morning run/walk at Caltech with students, faculty and of course Pink Turtles! Join us at the Christmas 2 Give near Dodger Stadium as we celebrate a healthy lifestyle and support a worthwhile cause. Christmas 2 Give was created to make a change in the lives of others, therefore this year they will be conducting a shoe drive. That's right, bring any shoes, new or used and lets give to the ones in need. Make sure to stop by the Pink Turtles booth before the race starts to meet up with your fellow Turtles and do a quick warm-up with me. (We’ll have people staying at the tent to hold onto any items you don’t want to carry on the 5K). We'll also be giving away a few Pink Turtles shirts for new members so come by and hang out with us. The Pink Turtles is committed to helping people get motivated and work towards a healthy lifestyle...no fees, no pressure. We go to these events to celebrate and finish together. Join the Pink Turtles at the LA Dodgers Foundation 5K. There will also be a 10K and kids race so the whole family can finish together inside of Dodger Stadium. Use the PROMO CODE DODGERS to get $5 off registration.